Who knew we’d see him again as early as February?! Well, it was the last day of February, but still. We were thinking he’d emerge in late March, maybe early April. For some reason, I’d envisioned him stepping out of his burrow as if on a red carpet with trumpeters on each side to herald his return. He would march out to reclaim his domain in full Geronimo fashion. 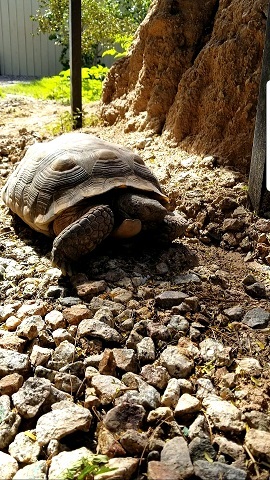 Instead, I found him sitting still on the rocks, covered in dirt and nearly blending in, as desert tortoises are wont to do. His manner of return was perfect. 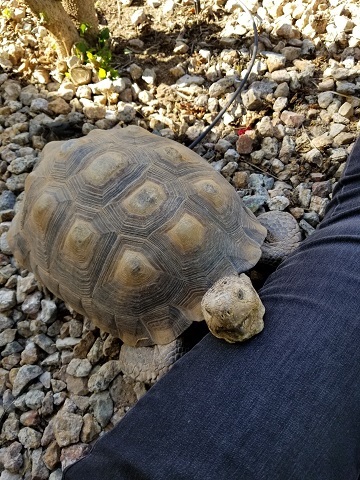 I went running to him, of course, and his adorable little face poked out of his shell as he blinked “hello” at me. He stretched out his neck and tilted his head up when I petted his nose. I stroked one side of his neck for a while, and then he turned his head in the opposite direction so I could get the other side. 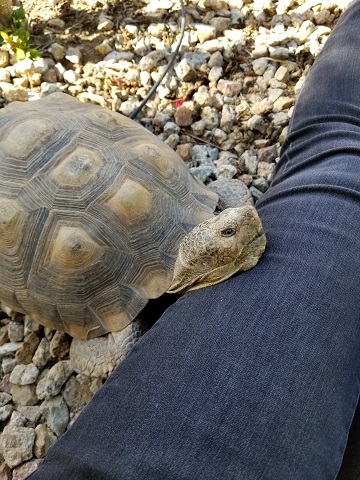 I flew back into tortoise mom mode. A good soaking was in order! 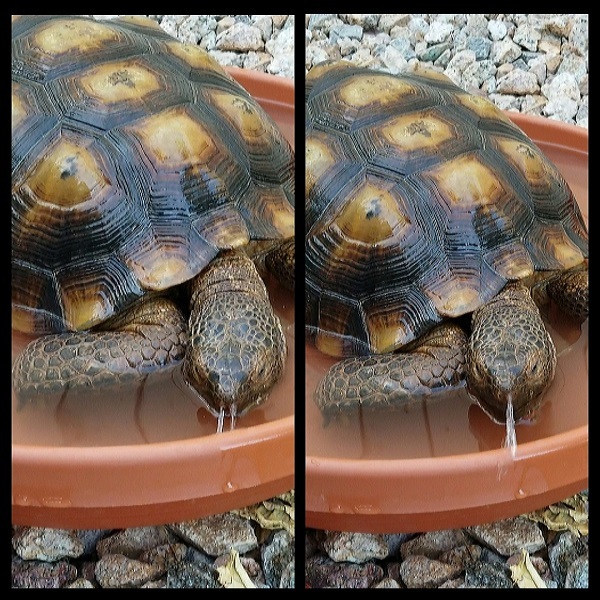 Geronimo needed to be hydrated after his long sleep. Hot water gushed from the garden hose for a few minutes before it gave way to the lukewarm temperature Geronimo requires. He sat in his bath and drank water and squirted it through his nostrils. He got his second soaking today. 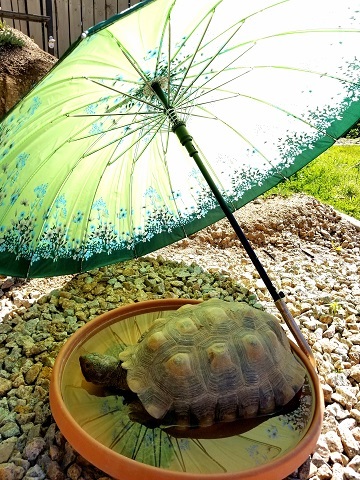 He likes to soak in the shade, so I propped a parasol on the ground to make an awning over his bath. Six days post-hibernation, he’s still moving a little slowly; he’s not quite back to his tall, robust, rowdy self. He’ll walk a little, plop down and doze off, then wake up and walk again. He shuffles hither and yon in search of snacks, which are everywhere. He eats the spring grasses on the lawn and the weeds in the rocks with impressive appetite. When he’s not eating, he spends most of his time near his burrow, on and around his burrow’s terrain. 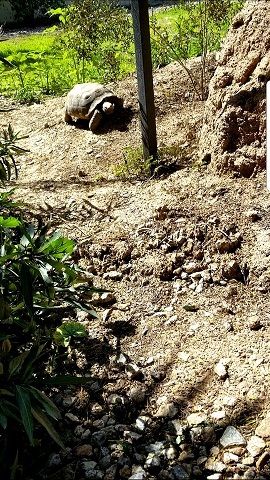 He also naps in the entrance of his burrow. At sundown, he goes all the way back in for the night. THIS GUY. IS SO. CUTE. 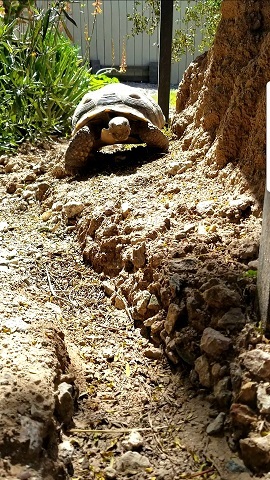 Geronimo’s been coming out of his burrow for six days now. Of course, I’ve been taking all kinds of pics. Here he is in all his 2019 glory. He’s 21 years old now! How I missed his little elephant legs!!!! Now toward the end of summer, we’ve learned yet more about our Geronimo as we’ve continued to observe his patterns of behavior this first cycle of seasons with him. The main thing we’ve discovered recently is that we have a personal meteorologist who has a built-in Doppler Radar. Geronimo tells us when it’s going to rain. We have a Geronimeter. Monsoon season began in July, as monsoon season does. We were in the backyard when the first dust storm rolled in and dropped the temperature along with it. 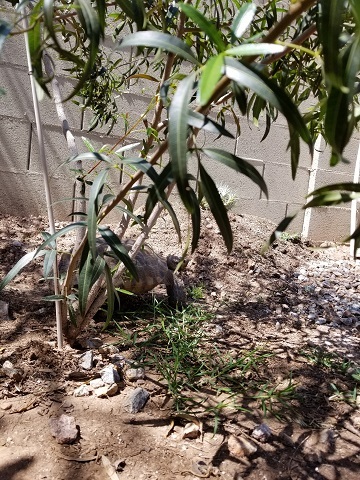 We looked over from the patio and saw Geronimo’s little nose poking out of his burrow. The wind picked up as the sky darkened. A wealth of mesquite pods swirled into space and landed in our yard. (Thank you, neighbor.) The rich scent of creosote saturated the air… classic indication of imminent rain in the desert. Geronimo readied himself at the entrance of his burrow as we stood on the patio in the blowing dust, all three of us watching the storm unfold. As soon as the rain began to fall, he came out and marched all over the yard, up and down along the back fence, patrolling his perimeter with a joie de vivre unlike any we’d seen in him before. He was clearly in his element. 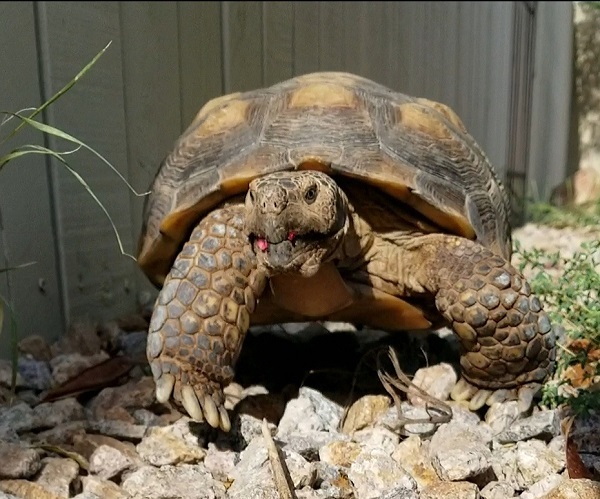 He’s since settled into a routine of coming out at night to crawl into the mass of verbena along the side fence, walking his back-fence path when he wakes up in the early morning (eating any hibiscus flowers and buds he can find along the way), and retreating to his burrow to escape the daytime heat. 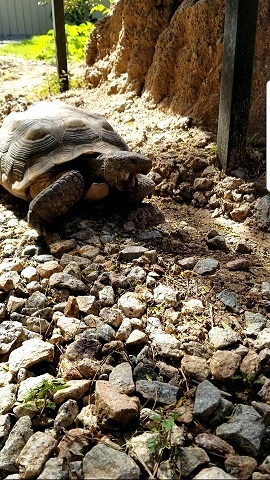 He’s back in his burrow by around 8:30am. The storms usually move through at dusk or later, and he comes out to revel in the rain. That’s Geronimo, living his best monsoon life. I wish I had pics of him in the rain to share here. Unfortunately, cell phones and rain don’t mix. Monsoon winds blow the rain onto the patio; nowhere remains dry. I have a few general pics of him, though (actually screenshots from video clips). 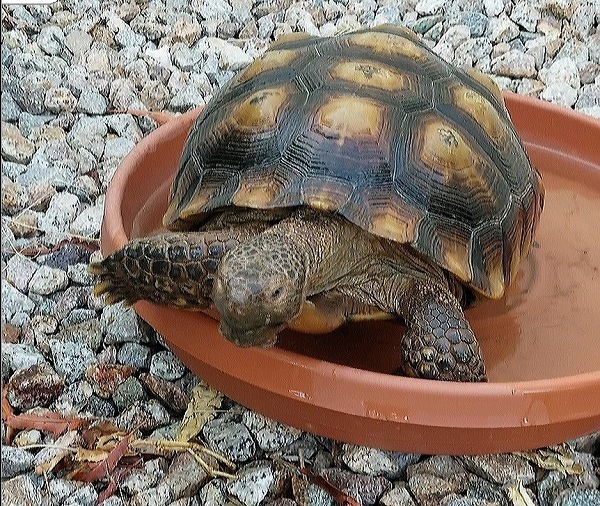 We’ve stopped soaking him and instead have placed his bath/water dish on the ground in front of his fence. He has fresh water in the dish every day, and he knows where to find it. If he needs it, he clambers in. If he doesn’t, he goes around. We’ve seen him squirting water through his nose more often than usual, maybe to hydrate his nasal passages. This dish is actually a large plant saucer (I can’t remember whether I’d mentioned this in previous posts). That’s all I’ve got for this update! Next month, Geronimo’s vet will notify us to bring him in for their annual pre-hibernation clinic and screening. It’s unreal that the summer’s almost over. 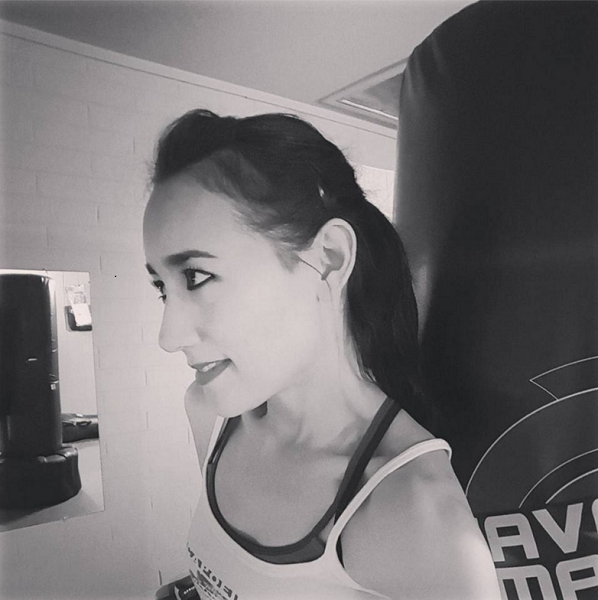 A quick Geronimo update is in order! We’re in the swing of summer now, and Geronimo has gotten with the program. 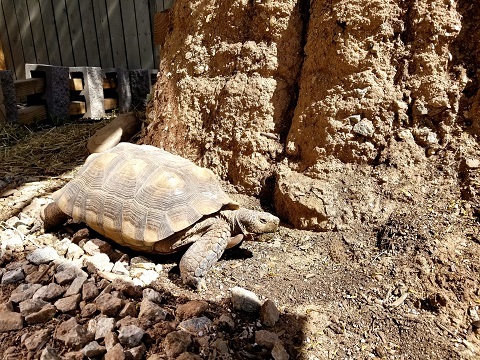 But he does come out to bask in the sun for a little while at least every other day (usually in the late morning), just for a quarter of an hour or so. 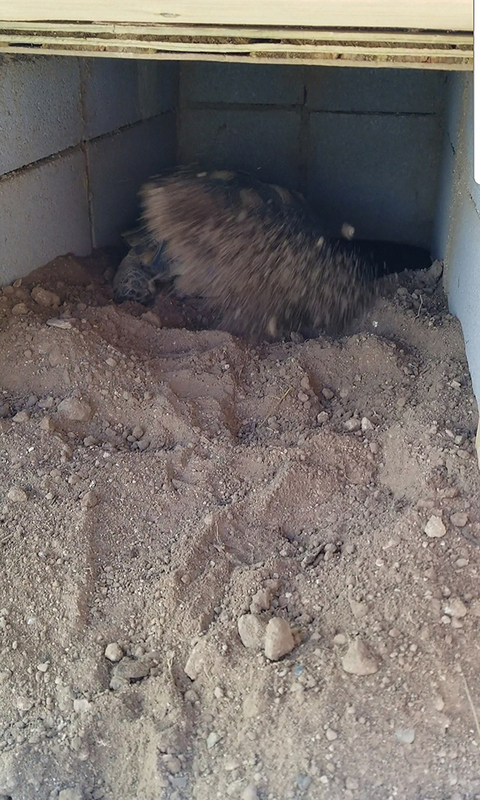 Then he goes right back into his burrow and disappears in his cave. 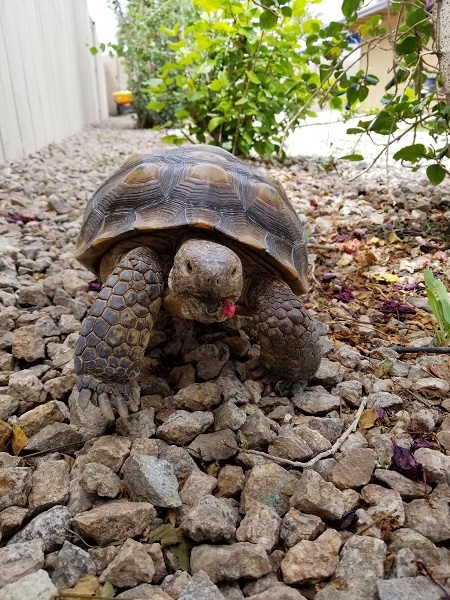 Every once in a while, we’ll see him cruise around the yard eating grasses and low-hanging hibiscus flowers. 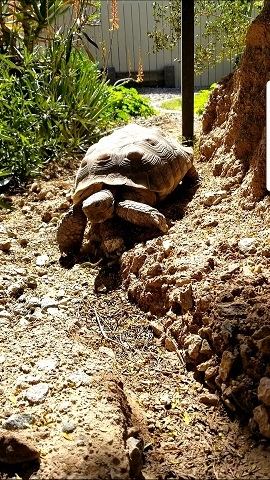 He’ll sometimes emerge from his cave to sit in the patio part of his burrow, facing out. He likes it when he does this and we sit with him on the outside. He enjoys our company, even if he’s out of reach. How do I know this? He told me. A mother knows. 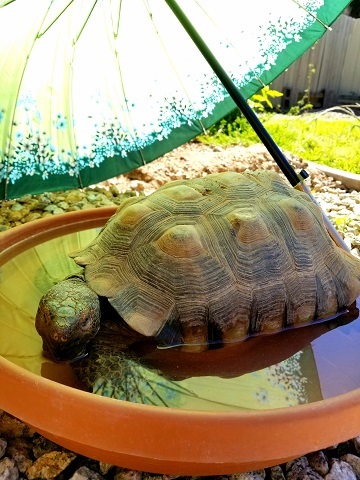 Once a week, usually on the weekend, Geronimo comes out and we’ll soak him for as long as he’ll lets us, which is pretty much just as long as he needs to drink water. He has a drinking routine; it involves sticking his whole head below the surface. He blinks his eyes underwater a few times and squirts water through his nostrils when he comes up for air. It’s like he’s rinsing out his eyes and nose, which is probably exactly what he’s doing. Have I ever mentioned that his favorite part of soaking day is the Romaine lettuce he gets for his after-bath treat? 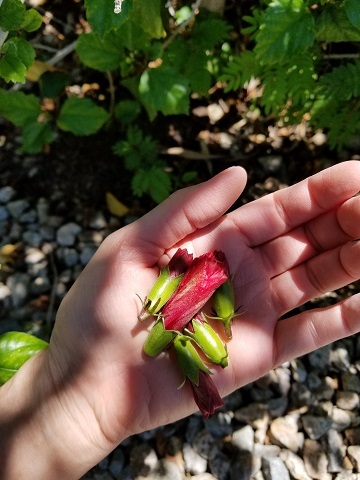 And then we’ll pull some hibiscus flowers from the top branches of the hibiscus bushes and hand-feed them to him. His favorite! All has been business as usual around here, and then one day I saw dirt flying out of Geronimo’s burrow. Next thing I knew, Geronimo was gone. 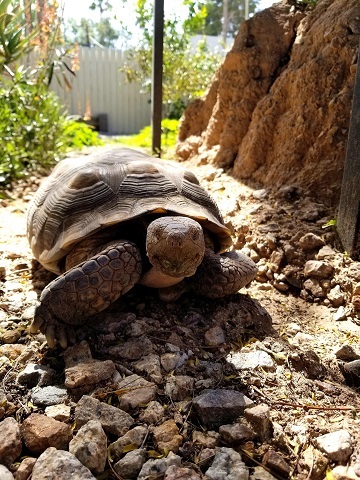 For being such slow creatures, tortoises have a way of making things happen fast. Ours does, at least. I don’t know why this surprises me anymore. 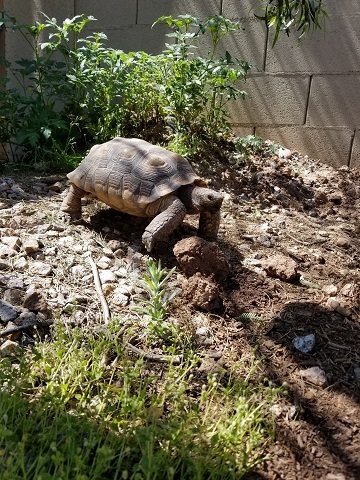 I just… when Geronimo started digging out the back corner of his burrow, I didn’t know he was going to dig until he was out of sight! He dug deep enough to get under the cinder block walls, and then he dug straight ahead, still at a diagonal, carving out a tunnel. 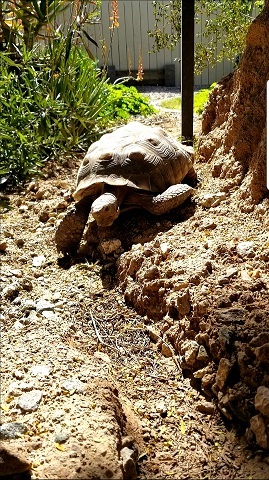 I suppose that’s the definition of an actual tortoise burrow. Duh. 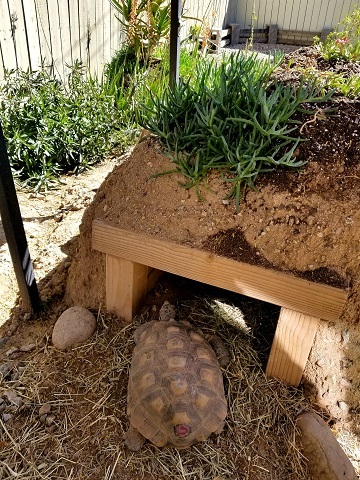 When we built the burrow, we thought that Geronimo would just chill at the back of it, and he did, for a while. 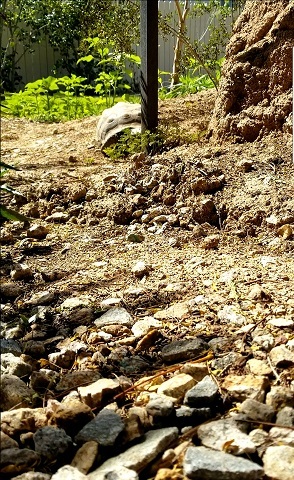 When the days started heating up, he built his real burrow. Turns out that all we built was a semi-enclosed porch… which is fine. 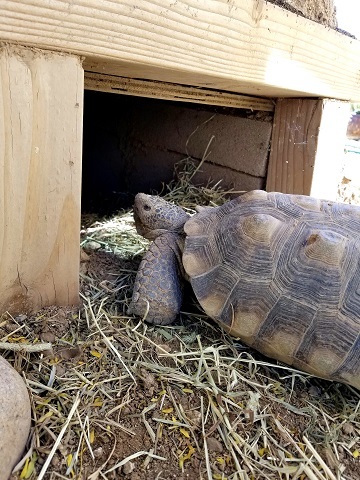 We’re pleased that Geronimo loves his burrow enough to feel that it’s a good entrance to the lair he’s digging out for himself. Meanwhile, Callaghan started the process of securing the burrow’s cinder block walls to its plywood ceiling with construction-grade metal brackets, performing the necessary contortions in defying the laws of spatial limitation. I, myself, can barely fit my upper body into the burrow. Callaghan has to reach in and maneuver a drill in the far-back upper corner! I don’t know how Callaghan does it, exactly, but he does. I know that his process involves lying on a couple of large tiles. 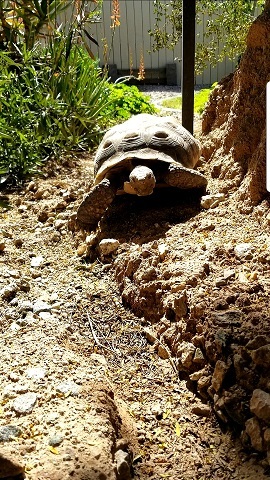 Consequently, each time he finishes fastening a bracket and clears out for the day – only one bracket can be done at a time – Geronimo goes back to his burrow and gets mad because the dirt inside had been flattened out; he has to dig at the burrow floor in order to fluff it up again. Geronimo digging. You can just see his little back elephant leg behind the spray of dirt. Long update short: Geronimo spends his nights (and most of his days) deep in his new digs (literally). Also, he’s adorable. Nothing new there! Geronimo is so ridiculously cute and sweet. That’s good for him, because he raised hell in the laundry room on Sunday. I’m not exaggerating. I wish I’d taken pics. 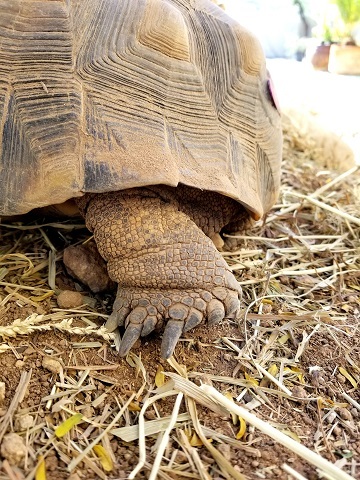 Just when you thought that a tortoise is the most placid creature to walk the earth, you get one. Our little “dinosaur of the desert” went Jurassic up in that laundry room. We don’t usually allow Geronimo into the laundry room because there’s a lot of stuff he can get into in there, but I was running in and out trying to get through the laundry in a hurry because I was also writing… so I thought, why not. As long as I’m here, he can’t get into trouble. Everything was fine, except that he kept getting between my feet as he tried to push his way between me and the washing machine, causing me to stumble and almost trip as I wanted to avoid stepping on him. When he wasn’t between my feet, he was repeatedly folding the large rug back from the corner – or, more accurately, he was bulldozing it back – because he wanted to sit on the tile beneath it. The next time I went out to the laundry room, he came with me again and fitted himself into the corner of the bottom shelf of the bookcase we have in there. I turned my back for one minute when I went to the side yard to shake the dust from the dryer’s lint trap. When I got back to the laundry room, Geronimo had ripped the shelf’s contact paper lining to jagged shreds. Because I live my life in the hindsight zone, I decided to leave him in the laundry room when I went back into the house that time. It’ll only take 10-15 minutes to put away this load of clean clothes, I thought, and then I’ll come back to check on him. He just seems so happy in the laundry room! If the worst thing he can do is tear up some contact paper, I can live with that. I was in the bedroom folding the clean laundry when I heard a clanging commotion outside. It sounded like someone had thrown a T.V. into a metal dumpster. It sounded like it might have come from behind our back fence, as our “alley” is an apartment complex parking lot, and we sometimes hear people throwing heavy things into the dumpster back there. I resisted the urge to run to the laundry room to make sure it wasn’t Geronimo. It can’t be him, I thought. How could he make such a racket? 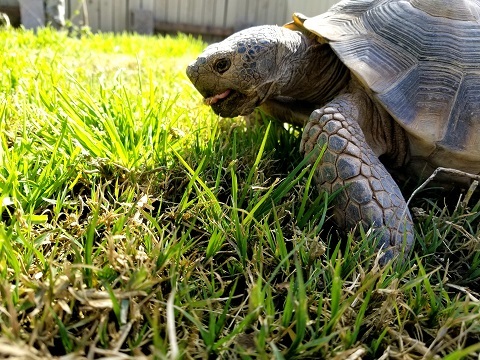 He’s a tortoise. Someone threw an appliance or an armful of pots and pans into the metal dumpster, that’s all. When I went back to the laundry room, I found that hurricane Geronimo had struck. The laundry room was trashed. The narrow, spindly metal shelving rack we used to hold rags and garden tools and cables had fallen. On the way down, it caught onto the metal post of the table next to it. The half-fallen rack obstructed the middle of the room; not only was it too tall to land flat on the floor, but it was dangling from the metal table post. It hovered above the floor at an angle, festooned with towels and one of its shelves swinging free. After some searching, I identified Geronimo sitting in the middle of the havoc he’d wreaked, directly, to my horror, beneath the gigantic pair of gardening shears (with long, pointy Edward Scissorhands blades) that balanced precariously from the juncture of the rack and the table post. The shears were tangled up with coils of cables and cords, a loaded tool-belt, a length of extension cord, and whateverthehell else we had hanging up there. Oblivious to the danger he was in, Geronimo held down his spot, which was, no doubt, exactly the spot he wanted to be in. He’d achieved his goal. All he had to do was simulate a catastrophic natural disaster. All I wanted to do was get Geronimo out of harm’s way and make sure that he was okay. To achieve my goal, I had to perform a Cirque du Soleil contortion sequence in order to carefully extricate the Edward Scissorhands shears from the table and the rack so I could remove the rack without the shears falling onto Geronimo, who was still sitting in his spot, not moving, probably because he was plotting his next big move. With the metal rack balanced on my right shoulder and my feet planted in a leaning horse stance, my right foot braced against the door’s threshold, I managed to grasp the shears with my left hand, twisting my upper body to settle the contraption of metal shelving more on my back so I could transfer the shears to my right hand and toss them out the door. Then I had to remove the whole rack, which was also a feat because it’s so tall, and it was jammed across the width of the room between the wall and the shelving on the opposite side. Geronimo had pushed himself up against the rack’s forward-most back feet. I had to extricate the rack without hitting him. I managed to lift and maneuver the rack backwards out of the room, carry it to the side of the yard that he can’t reach, and throw the whole thing over the cinder-block barrier, towels, cables, tool belt, and all. I returned to the laundry room. 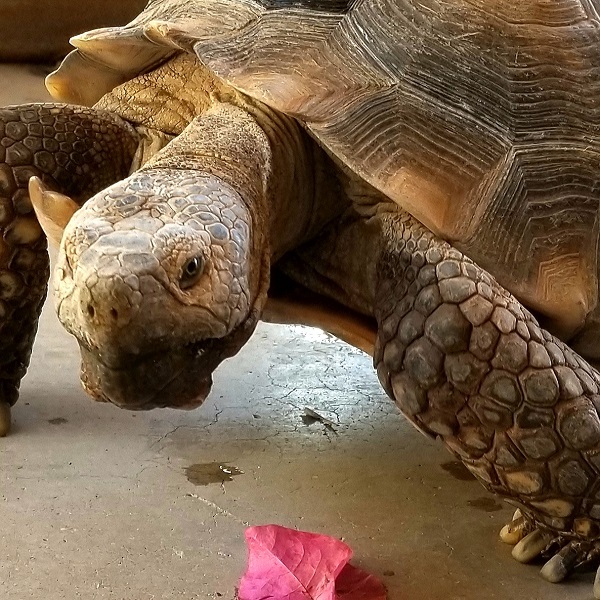 Geronimo was still sitting in his spot, camouflaged in the rubble, surrounded by towels, bottles of laundry detergent, the heavy box of motar, an empty metal bucket and a metal wastepaper basket (so much metal! ), the tools and the cords and the so on and so forth. I checked him thoroughly and found no damage to his shell, which is probably made of Kevlar. “That’s it,” I said. “You’re done in here.” Even though it was my fault for leaving him unattended. Who knew that our gentle little Stegosaurus was going to pull a T-Rex and storm the laundry room? I picked him up and carried him out. 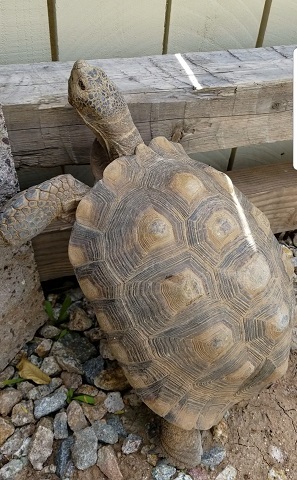 He huffed and puffed in annoyance at being evicted, and when I set him down on the patio, he literally stomped off to his burrow, as if I’d sent him to his room without dinner. I left the laundry room exactly as it was, so Callaghan could see what our prehistoric child of the desert did while he was gone. Seriously, guys. I’ve had various combinations of dogs and cats most of my life, and I’ve never seen dogs or cats cause this sort of destruction. Geronimo loves the laundry room. When we couldn’t find him yesterday afternoon, we split up and combed the entire yard, and then we noticed that the laundry room door was open. It’d been closed, though! We went in and found Geronimo sound asleep, tucked away behind a tall 30-roll pack of jumbo Charmin toilet paper rolls. The door had been closed, but I must have neglected to pull it all the way until it clicked. He’d pushed it open. I can’t get over his strength! I think my next minimalism project is going to be the laundry room.